Language specialists are frittering away more good grant money on researching regional accents in cows. "They decided to examine the issue after dairy farmers noticed their cows had slightly different moos, depending on which herd they came from." Farmer Lloyd Green, from Glastonbury, said: "I spend a lot of time with my ones and they definitely moo with a Somerset drawl. Farmer Green sounds like he might be spending a little too much time with his. So why didn't the researchers ask him what he thought the cows were saying? COW 1: Oo-ar, Farmer Green, you spend an awful lot of time with us. Is everything all right at home? FARMER GREEN: Yes thanks Doris, but you're my best friends (and I want to sell your milk, actually). 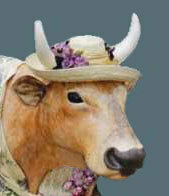 COW 2: That hat looks ridiculous, you know. Isn't that a great image? Presumably, then, our City Farm cows here in London are dissin' their breadbin with the shizzle coz like wha'? Wha'evva! That is so sick, uppin' here.